Monday - Thursday: 7:30 a.m. - 5:00 p.m. Friday: 7:30 a.m. - 4:00 p.m.
River Ridge Dermatology is an independent practice specializing in medical and surgical dermatology and serving the southwest Virginia community. 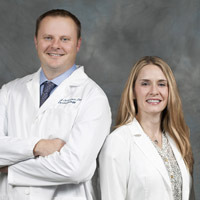 River Ridge was founded by Dr. Chad Johnston in 2011. The practice is located right off of Route 460 in Blacksburg, in front of Lewis-Gale Hospital Montgomery. River Ridge Dermatology's caring and experienced staff provides dermatological services for the whole family. Special care is taken to give personal attention to the needs of each patient as an individual. We ensure that our patients are informed and involved with their medical care at every stage of treatment. Our medical team treats a wide range of skin conditions, including acne, eczema (dermatitis), rosacea, rashes, wrinkles, moles, warts, cysts, birthmarks, boils, hair infections, and poison ivy. River Ridge offers XTRAC laser therapy for psoriasis and vitiligo. Johnston is the lead physician at River Ridge Dermatology. He is board certified by the American Board of Dermatology and received his undergraduate education from West Virginia University and earned his D.O. from the West Virginia School of Osteopathic Medicine. He previously practiced dermatology at New River Dermatology. Susan Gaither, FNP, joined River Ridge Dermatology in 2012. She is licensed by the state of Virginia as a Family Nurse Practitioner. Susan completed her undergraduate degree at Bluefield State College and earned her master's degree from Radford University. She has more than eight years of experience practicing dermatology.